Visit Laskey's expansive showroom and view livingroom suites, bedroom suites, occasional chairs and tables, full dining room sets, children's furnishings, recliners, and more. From traditional to modern, there are styles and fabrics to satisfy even the most sophisticated shopper. 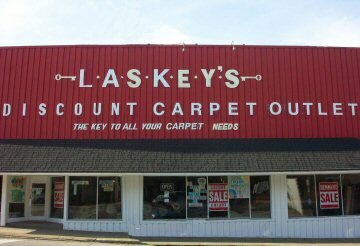 Don't forget to visit Laskey's Carpet Outlet for the latest deals on marked-down remnants. High-quality carpets are purchased from manufacturers at the very lowest prices possible and we pass those savings on to our customers! 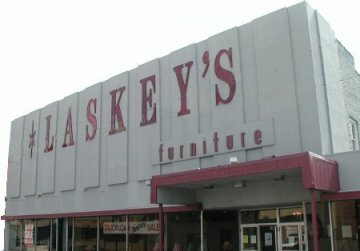 Laskey's is a full-service furniture store. Design and decorating advice is readily available from experienced sales staff. Special orders on furniture and carpets are a daily routine for Laskey's. We offer six months free layaway or twelve months no interest financing on most sales. Ask us about our financing arrangements. When it comes to home furnishings, Laskey's is the only place to shop. Our customers' satisfaction is our number one priority! Hersh Laskey started his retail career in the late 1940s as a peddler, selling pots, pans, rugs, and blankets to the Shenango Valley focusing in the Greenville area. The throw-rug business boomed in 1950 and Hersh decided to increase his inventory by opening a furniture store on Shenango Avenue in Sharon. Laskey was forced to move to Farrell in the 1950s when his building was tagged as the future site for the Downtown Sharon post office. Laskey remained in Farrell until 1971 when he decided to expand once again and moved into a three story building on Sharpsville Avenue in Sharon. Laskey soon found out that three floors of furniture were a little too much to handle alone, so Laskey coaxed his son, Steve, to join the business. Steve had retail experience as he was working at the W.T. Grant Co. at this time. Laskey, though, had greater dreams. 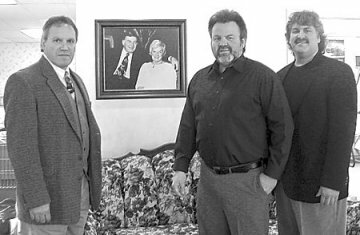 He wanted a family-oriented business, one large enough to accommodate all three of his sons. Gary joined the company in 1979 after working in management at Sharon Steel for 12 years. Jay, the youngest, was the lone holdout. Jay graduated from Edinboro University and went to work for Trumbull County Children Services. His father persistently invited him to become a part of the business and in 1980 his persistence and family ultimatums paid off and Jay joined his father and brothers. After encouraging his sons, Laskey retired in 1983 knowing his legacy would remain strong. Laskey passed away in 1986, but his influence on the furniture business remains strong. After 30 years on Sharpsville Avenue, the business outgrew the building and a new endeavor began in 2000 when Gary, Steve, & Jay moved to their current location at 37 North Water Avenue in Downtown Sharon, PA. With the 3rd generation now beginning to enter the business, Hersh’s dreams are being realized. From a struggling peddler to a multi-million dollar business, the dream is in fact alive. In December of 2005, Gary Decided to retire after 26 years in the business. We at Laskey’s will miss him but wish him the best. Because of this vacancy the 3rd generation is being called upon to step up to the plate and carry on the fine tradition of Laskey’s Furniture and Carpet.